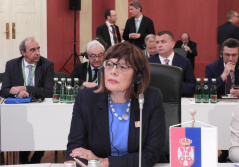 The Speaker of the National Assembly of the Republic of Serbia Maja Gojkovic is taking part in the Conference of Parliament Speakers of EU Member States and parliament speakers of candidate countries in Vienna, organized by the Austrian Parliament. Speaking at the Conference, Gojkovic stressed that it is only with the Western Balkans as an integral part that the EU can be whole and secure. Speaking of the EU its neighbours, Gojkovic said that this topic gives the candidate countries hope and courage that they remain the focus of EU policies despite the challenges the Unions is facing which call for open dialogue, wise and bravely implemented choices and solidarity in dealing with their aftereffects. The Serbian Assembly Speaker stressed that the Western Balkans’ accession prospects should be credible, with visible goals set by a stable and strong EU grounded in the principles and values this big and unique project is based on. “As the Parliament Speaker of a candidate country I want to stress that the Republic of Serbia is committed to dialogue and cooperation on all outstanding issues in the region as this is the only way to overcome problems, maintain stability and create a secure future for our citizens”, said Gojkovic. Gojkovic also said that Serbia expects the EU, as the mediator in the Belgrade-Pristina dialogue, to effect a revocation of the customs taxes imposed on Serbian products and products from Bosnia and Herzegovina. “Pristina has been enforcing this illegal measure for six months now. Condemning and revoking it would send a clear message that unilateral radical moves are unacceptable and would allow a continuation of the dialogue toward finding a mutually acceptable solution”, said Gojkovic stressing that Belgrade is ready to continue the dialogue despite the fact that the other side has not fulfilled any of its obligations. Gojkovic went on to say that Serbia is taking part in all of the challenges the EU faces such as the economic and migrant crisis and climate change and is investing further efforts in its own reforms and harmonization with EU standards. “We do this to contribute to one of the Union’s most successful policies – the enlargement policy. Our commitment to the integration process is based on the belief that all the effort and sometimes difficult measures are in the citizens’ best interest, as well as in the interest of the EU”, said Gojkovic. The two-day conference is attended by representatives of the EU Member States’ national parliaments, among them 30 parliament speakers of the EU Member States and candidate countries - Serbia, Montenegro, North Macedonia, Albania and Turkey. The Conference of Speakers of the European Union Parliaments, opened by the President of the Austrian National Council, Wolfgang Sobotka and the Vice-President of the European Parliament Mairead McGuinness, features debates on “The European Union and its neighbours” and “The European Union ahead of the 2019 European elections - further development of cooperation between national parliaments and European institutions”. National Assembly Deputy Speaker Veroljub Arsic is also part of the delegation.